Whether your car has experienced minor dents or needs major car collision repair, Hammer’s Autoworks, Springfield, MO’s leading auto body shop, has the experience to fix it right. 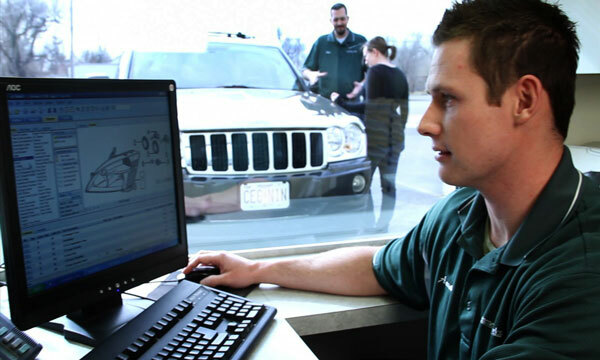 Our complete unibody, frame, and automotive repair capabilities are state-of-the-art. Hammer’s utilizes Car-O-Liner unibody racks with computerized measuring to accurately return your vehicle to its original factory specifications. Whether your vehicle needs collision repair on a full frame or unibody structure, Hammer’s Autoworks has the equipment and OEM Certified technicians to correctly repair your vehicle. When it comes to minor details like door gaps, seals, and body style lines, the technicians at Hammer’s are perfectionists. Hammer’s technicians use corrosion protection and weld-through primers extensively to insure that your vehicle doesn’t experience premature corrosion or rust after visiting our auto body shop. Our advanced techniques and technology make Hammer’s your choice for automotive paint repair in Springfield, MO. We use new AFC Quadraft and Spray Bake down draft paint booths with a bake cycle to paint your vehicle. These state-of-the-art paint booths work to reduce dust particles from attaching to your newly-painted vehicle. This equipment, paired with our expert painters and Axalta Premium Waterbourne technology paints originally used on your car, create a professional auto body paint job that is backed by our lifetime warranty and will last for years to come. Your first stop at Hammer’s Autoworks is our friendly office area. Our professional, courteous staff will answer all of your questions about your auto body repair. Our Estimators use the latest in hardware and software technologies for auto parts and labor information.